Siwertell, part of Cargotec, has received an order from a port development company for a high-capacity ship unloader destined to serve a busy grain terminal. The ST640-M screw-type unloader has been ordered as part of an ongoing development programme and will replace an old mechanical unloader. The customer chose the Siwertell unloader after a two-year tendering process, which gathered information on global innovations in the field, with a particular focus on minimizing air and water pollution. “A wide range of factors influenced the customer's decision. Siwertell offered the best technical solution with the best environmental performance and we are able to deliver the necessary high capacity, efficiency and reliability. We offered all this at a very competitive price,” says Juha Huovilainen, sales director at Siwertell. Siwertell unloaders are ideal for virtually all dry agribulk cargoes. Their screw technology transports the cargo very gently, resulting in minimal degradation. The new unloader will have a rated capacity of 1,200tph (tonnes per hour) and will be able to handle ships up to Panamax size. It will be constructed in Europe and China and delivered in sections for final completion on site during the third quarter of 2017. “This order identified Siwertell as a reliable supplier with a convincing list of references and testimonials. Our totally enclosed technology eliminates spillage and keeps dust emissions to an absolute minimum, making it a perfect fit for the customer's purposes,” Huovilainen continues. As extensive support during the first year of operation to maximize the unloader's performance and long-term reliability is included in the contract. 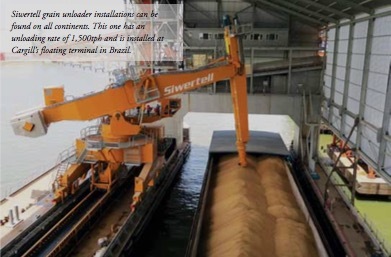 Siwertell ship unloaders and loaders are based on unique screw conveyor technology, in combination with belt conveyors and aeroslides, and can handle virtually any dry bulk cargo, such as alumina, biomass, cement, coal, fertilizers, grain and sulphur. Siwertell's product portfolio includes ship unloaders, mobile ship unloaders, ship loaders, conveying systems and complete bulk terminal solutions, all of which are designed to ensure environmentally-friendly and efficient cargo operations.